Brassy and bold, Flash Silvermoon does not disappoint with her wide range of music. This CD features a bit softer side of Silvermoon. The tone is softer with love songs but she still keeps her edge. Silvermoon has an expressive voice, which she uses in many different styles from Indian style to blues to jazz to rock. She covers an array of styles excellently. On this CD some of the songs are more synthesized but Silvermoon keeps the message in them real and grounded. 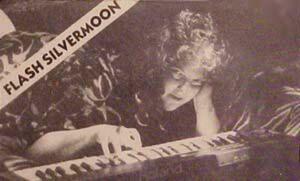 Silvermoon is very talented performing the vocals, keyboard, synths, drum, and percussion. Each song has a unique style supported by the instrumental back up to the vocals. Love found and lost, Silvermoon makes the listener ache with empathy as she sings of lost love and a desire to fall in love again. Less spiritual and more main stream, she takes the listener though the emotions of losing a love and a desire to move forward. Anyone could relate to the love songs on this CD. The words in her songs help the listener to visualize the scene she is singing about. With these beautifully descriptive words the listener can see themselves standing on the shore and longing for love to come into their lives. Silvermoon puts the listener right there in the melancholy moment. However with the next tune she lifts them right out of the melancholy and into joyful and rejoicing. Each song is different and unique, creating a different mood with each track. Silvermoon keeps the listener attentive to see what she will do next. Going from bluesy to jazzy, Silvermoon changes the mood and takes the listener on a roller coaster ride through her CD. In this CD she sounds very synthesized. Her voice is so distinct and strong, having it synthesized so much is a bit disappointing. However overall this CD will make a good addition to any collection.